Friday morning was a series of unfortunate events for me, to put it mildly. Our "adorable" cat woke me up with her incessant meowing at 3 AM as she has been doing several nights. I couldn't get back to sleep so just surrendered and got up. Starting out the day sleep deprived is not great. Then there was some tension in the household in the morning. Normal stuff, but still. Next I accidentally backed into my son's car in the driveway due to sleep deprivation, anxiety, or maybe not looking over my shoulder (as Mr. Husband kindly suggested) Just some nice bumper damage to the van, of course, not much damage to my son's beater car. When I got to work, my teaching partner was at our printer and there was a huge stack of paper that had been printed. I said, "What's going on there?" I'm not proud to admit that I was already prepared to blame another colleague for over-printing. She told me kindly and gently that it appeared to be some copies of the article on helping refugee and immigrant families that I had been talking about. No, no, no!!!! I didn't meant to do that! I was trying to print a single page of that 32 page document for a meeting. Gaaaaaah! If you're a teacher in my district or probably any district, you know that copies and paper are at a premium and I've already been in trouble more than once for over printing/copying. I sat at my desk, looked at the clock, and realized that the students would be walking in any minute. I closed my eyes and tried to take some deep breaths and ground myself. But to be honest, I was a little worried about the damage I might do if I moved from my desk and continued my day. Just then I noticed Mr. Husband had sent me a text saying, "Don't worry about the cars. It isn't life or death. Just enjoy your students and have a good day. " Thank God for Mr Husband. None of this was life and death. I got my perspective back, took one more deep breath, and went out to greet the Newcomer students. On Fridays, during our morning meeting we do an activity called "Fill the Bucket". This activity is a combination of 2 things I've learned about as a teacher. 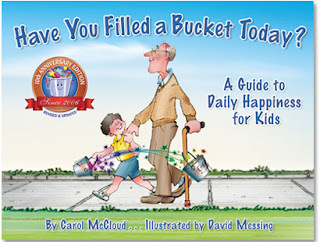 The first part comes from the children's book "Have you filled a bucket today?" It's all about being kind to each other and helping each other- bucket-fillers. The second part comes from an activity called (I hope I'm remembering this right) "Put-Ups" (instead of put-downs) This is an activity that a 4th grade teacher I know does in his classroom. He brings a kid up to the front and has the other kids take turns saying positive things to her/him. The first time I saw this activity, he had a kid come up who was rather socially awkward, kind of always disheveled, a little out of it, but very sweet. He seemed uncomfortable at first, but as the compliments kept coming, he visibly straightened up and his smile grew wider and wider. When it was over, he said something like, "I didn't know you all thought I was so great!" This activity was so genius to me. So simple. So I did what any good teacher does,and I stole it to use in my own classroom. So we choose a different kid every Friday to have their bucket filled. They sit in the teacher's chair (which they're all obsessed with) and students take turns telling them why they're wonderful. We encourage them to say specific things and give examples. It's beautiful and powerful, both for the student on the receiving end and for the kids giving them. There are lots of smiles and laughter. Often there are also tears. I've seen many students start crying when they hear how others perceive them. Our kids have gone thorough so much, are going through so much, that I think hearing that others care about them just breaks them open. When we got to our Fill the Bucket time on Friday, my teaching partner said we were going to fill my bucket. The kids all started clapping loudly and I sat down in the teacher's chair to receive their love. I can't tell you how much I needed that on Friday, and it made all the annoyances and troubles of the morning wash away. I was profoundly moved by the things they said to me. Most teachers who really care about what they're doing (which characterizes nearly all the teachers I know) aspire to bring a certain presence to their classroom and create a certain climate. My deepest desire is to create a climate of safety, love, respect, fun, openness, happiness, joy, and calm. My biggest wish is that my students know they matter, that I care for them, and that I believe in them. And, many of the things they said to me on Friday, showed that they think I'm doing these things. That I am creating the classroom for them and I'm there for them in the way I soooooooo want to be. Nothing could be more important than that. No test scores. No grades. Of course, I want them to learn, to master material. But, at the end of the day, the fact that these kids are telling me that they love my smile, that I help them feel calm, that they feel cared for, that I remind them to never give up...... well, my bucket is full to overflowing. When my teaching partner had her turn after all the kids and gave me a tribute, I started crying. About 10 kids tried to bring me kleenex. I thanked them and told them that my bucket was SO full. That my heart was full. That teaching THEM is one of the great joys and honors of my life. They cheered loudly. We always remind them at the end of these sessions, that they don't need to wait for Friday to fill someone's bucket. They can do it any time. 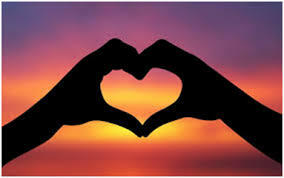 It's always worth taking the time to tell someone how awesome they are and how much they mean to you. Have you "put someone up" today? Have you filled someone's bucket lately? Try it. It's good for all of us.